If you live on your own, you need a tool kit. There’s going to be tons of things you have to fix around your home from leaky faucets to loose screws. The Fix It Kit is a small, handy kit that holds common tools for common problems. Not everyone is handy but everyone who is in charge of their own life will at some point need to do some minor repairs to something. Usually it’s cheap furniture but you may be surprised. It might be knocking down a random nail head in your apartment floor or replacing a socket faceplate. 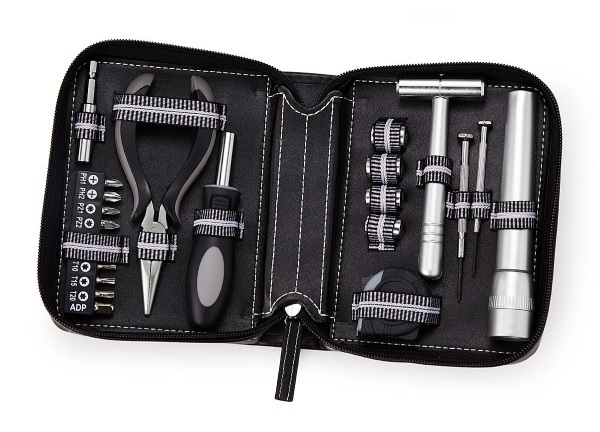 This tool kit, though it is small, has everything you need for common issues. The kit includes a small hammer, pliers, tape measure, screwdriver, interchangeable handle, sockets, even a flashlight. You can build and repair your cheap furniture with this. It comes in an easy carry case so you can store it anywhere. Comes in black and pink and will run you $30.